Blog on Holiday for the Great American Eclipse 2017! Stewardship Squad had another work/swim event at Luther Burbank Park with the Mountains to Sound Greenway. but the blog was on break for the Great American Eclipse of 2017-hope you got to see it! More Restoration on Lake Washington in the Mountains to Sound Greenway. 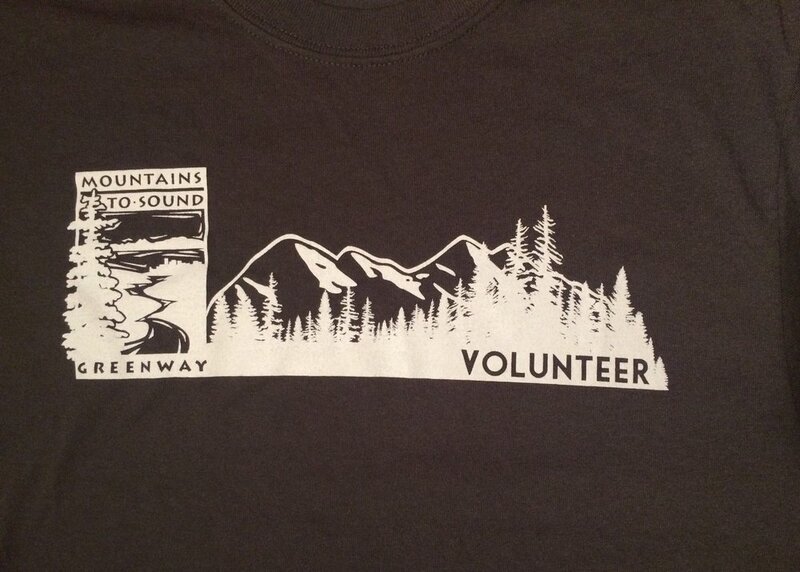 Mountains to Sound Greenway t-shirts for volunteering at five of their work parties! Several of our event hosts offer nice rewards. Once again, Stewardship Squad enjoyed working at the charming Luther Burbank Park with the Mountains to Sound Greenway. We tended our usual restoration site near Calkins Point on Lake Washington under the shade of the big Oregon ash tree / Fraxinus latifolia. This site used to be a dairy farm and the concrete stall remnants can still be seen (and played in). We weeded and mulched around native plantings before partaking of the warm shallow waters on the lake. Come on out and join us for our next stewardship/swim here on 8/22. The Greenway is over 1.5 million acres! Lake Washington Restoration at Luther Burbank Park. It must be summer, Squad has returned to Luther Burbank Park with the Mountains to Sound Greenway! We tended our usual restoration site near Lake Washington under the shade of the big Oregon ash tree / Fraxinus latifolia. The site is looking terrific after years of attention. We continued maintenance-weeding of noxious species and over-vigorous natives such as horsetail that threaten the survival of young plants trying to establish, such as red osier dogwood, snowberry and roses. A summer Squad event couldn't be complete without a run around the old concrete foundations of the former dairy barn as well as an extremely refreshing swim off the end of Calkins Point. We'll be back- come on out to enjoy this quiet spot on Lake Washington in the heart of the Seattle-Bellevue metropolis. Stormy Mulching with the Mountains to Sound Greenway Trust. This event was the first Stewardship Squad to be called off early by thunder and lightening! The weather was quite something. We began in clouds, had a gorgeous sun break and then worked through intermittent torrential downpours, finishing off with the thunder and lightening. Squad has worked many times at Luther Burbank Park with the Mountains to Sound Greenway Trust, but this was our first down in the south end. Indeed, the original plan was to work in our usual northern restoration area but the land manager decided the ground was too saturated- tromping around on soaked soil can badly spoil its natural texture of clumps and open pores, rendering it more like sludge than friable soil for roots to explore. Several volunteers enjoyed receiving their five-work-party MTSGT shirts. We look forward to returning this summer for our usual summer stewardship and swim events! Stewardship Squad always enjoys returning to Luther Burbank Park with the Mountain to Sound Greenway Trust. The restoration work has been progressing over the years- continued efforts to remove noxious species will always be needed (birds will always drop blackberry and ivy seeds from berries via their droppings) but a significant plateau of sustainability has been reached in our primary work area under the big Oregon ash tree. It is fun to branch out into new work sites, as was done this time. Calkins Point at the north end of the park is a charming, quiet and shallow swimming beach, highly recommended for families. Further south in the park is the more-popular lifeguarded swimming beach with buoys, it also has a sandy beach and a little bit of shade. Thanks to everyone for the great work and special thanks to the folks who sent in photos you see here (I had to make a rare event-absence). You can also have a look at all the terrific events Squad has done here over the years. We hope to see you soon. Lake Washington Work at Luther Burbank With MTSGT. This is our fourth summer returning to Luther Burbank Park with the Mountain to Sound Greenway Trust. It was marvelous to see how good the restoration site looked under the tall Oregon ash / Fraxinus latifolia! After much weeding of noxious species, such as blackberry, ivy, hawthorne, bindweed and reed canary grass, the wood chips heaped on the cardboard have really worked well to smother them. Now it is a nice clear carpet with native species hanging on throughout our dry PNW summers. Continued efforts to remove noxious species will always be needed (birds will always drop blackberry and ivy seeds from berries via their droppings) but a significant plateau of sustainability has been reached in this one area. Across the fence, the story is different. We pulled weeds out of saplings from up above our heads. Trees can easily be bent down the the ground by blackberry canes and bindweed vines. Our work will continue. The big shoreline restoration project on the nearby quiet little swimming beach is quite lovely. The views and warm water were perfect after a morning of good work. Have a look at all the terrific events Squad has done here over the years! Lake Washington Restoration & Swimming. Squad was down along the wetland again at Luther Burbank Park in the Mountains to Sound Greenway. where we weeded amongst the native plantings of rose, snowberry, vine maple and more. Blackberry / Rubus armenicus and hedge bindweed / Convolvulus sepium take years to bring under control and vigilance to prevent from re-establishment, so consistent stewardship is vitally important. These vining plants will easily weigh down young natives so much that they bend over to the ground, after-which they are easily smothered. Once the natives are more established, they have greater resilience- just like children. Our children in fact worked hard to yank, haul, dig and chuck large quantities of noxious weeds away from the wetland boardwalk and the small natives, with a bit of help from their parents and our work party host Joe. Great work. We were happily surprised to see that our favourite quiet swimming beach was busy with heavy machinery doing erosion control and restoration on the bank. While we couldn't swim there, we were delighted to find that the main lifeguarded swimming beach was sandy, warm and very fun. As was the land-art in the form of water-ripples, perfect for running around. Mountains to Sound Greenway Restoration Work on Sparkling Lake Washington. This is our third summer returning to Luther Burbank Park with the Mountain to Sound Greenway Trust. It was a warm day, but we knew swimming awaited and the tall Oregon ash provided dappled shade as we hauled buckets for sheet mulching. The area we worked used to be a trashy thicket but has been transformed by Squad and many others into a young native planting. The wood chips cover the cardboard, which helps significantly to suppress perennial noxious weeds such as blackberry & reed canary grass / Phalaris arundinacea. In the areas that sheet mulching hasn't been accomplished yet, we created 'rings of life' around the little natives simply by pulling away weeds & flattening or ripping them down. For plants only 24" high, a little goes a long way until they have time to get taller. Of course we dug blackberry too. And of course we played and swam on the gorgeous sparkling lake! We will be back in September on the 4th Tuesday. Lake Washington Wetland Weeding & Swimming. 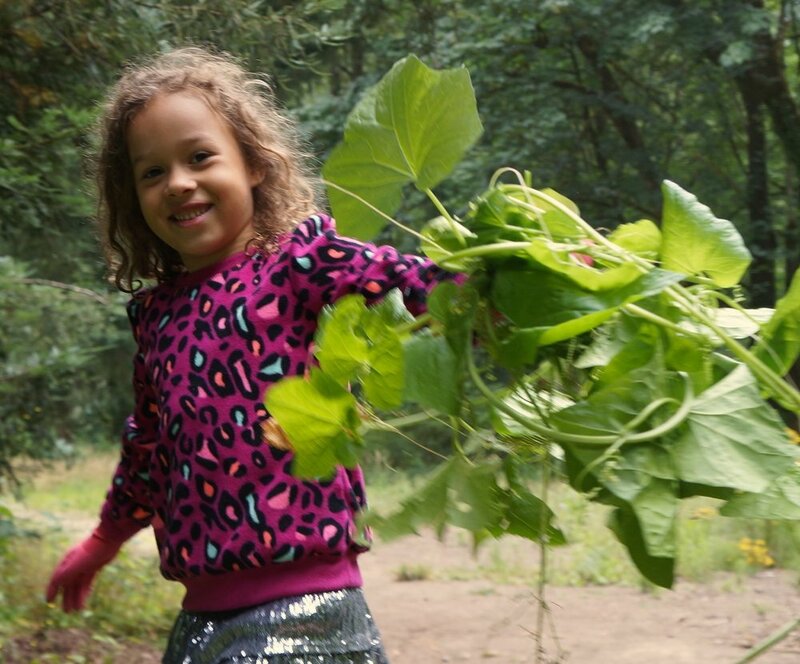 Stewardship Squad returned to Luther Burbank Park with the Mountains to Sound Greenway Trust, a favorite destination for combining stewardship with swimming on hot summer days. The kids were excited to be working on a new spot, deep in the wetland. We felt like we were on a jungle expedition as we bushwhacked our way back to the site. Our mission: blackberry and ivy removal. The kids deftly dug, clipped, and pulled as the temperature continued to rise throughout the afternoon. By the end we had cleared a substantial section and everyone was ready to cool off. We made our way to the shore of the lake and the kids swam, the parents lounged, and a bald eagle swooped low overhead. More weeding & swimming in the Mountains to Sound Greenway. Lake Washington was at its finest during the height of a hot summer. Fortunately the large Oregon ash / Fraxinus latifolia trees in the wetland buffer shaded us as we pulled noxious weeds from native plantings. After working at a leisurely pace in the sultry weather we were joined by even more homeschooling friends for a fun afternoon in the refreshing lake. Conspicuous across our work site were thick mats of dead (for the summer) noxious stickyweed / Galium aparine that had clearly been smothering the small native plants back in spring when their growth is rampant. The dry mats of stringy, grasping stems made clear why it is also known by the name bedstraw and also cleavers, as evident by the grasping round seedballs left all over our clothes and gloves. Surely you know them. Indeed it was such small hooks on burrs that inspired the creation of velcro. Our less-seen native species of Galium include small bedstraw / Galium trifidum & boreal bedstraw / Galium boreale. They are in the family Rubiaceae, which includes coffee, and supposedly the seeds of G. aparine can be used as a substitute as well as having edible foliage with medicinal properties. A perfect post-weeding swim in Lake WA on Mercer Island. Mountains to Sound Greenway choose a shady spot for our weeding work beneath a large Oregon ash / Fraxinus latifolius at Luther Burbank Park. The soil was completely dry, but the native plantings were hanging on well. So were the weeds. We kept busy pulling noxious species away from the rose, mahonia & red osier dogwood. There were many invasive common hawthorn / Crataegus monogyna seedlings. To our chagrin, we looked up at our lunchbreak tree on the park lawn and saw a lovely small tree of just this invasive variety. The children were very confused as to why it was preserved by the park staff while we had worked all morning to eradicate its progeny. Perhaps an interesting lesson on multi-agency/organization coordination. This is certainly a tree that should be hit with the mower. We swam at the quiet north end of the park, enjoying wide views across Lake Washington. We even had the amazing opportunity to see a dragon/damsel fly nymph (larvae) emerge from its watery lifecycle and gradually unfurl its wings over 10m or so. Stunning. Read about their amazing life cycle here.